Return to the true essence of real chocolate thanks to our unique raw production. The absolutely best chocolate bar in the whole universe. The Chocolate Lifebar energy bar by Lifefood brings you a truly unique chocolate experience. With its organic raw cacao beans, this energy bar offers the full health benefits of this delightful ingredient as well as an outstanding taste. Together with the perfectly balanced amount of dates, cashew nuts and vanilla powder, this Chocolate Lifebar is a real choco-ecstasy. Rediscover the essence of real chocolate! The best chocolate like energy snack bar ever! Raw vegan organic energy bar for whenever you want to feel alive and strong. Dates* (54 %), Nuts* (30 %; Truly Raw Cashew Nuts*, Almonds*, Hazelnut Paste*), Raw Chocolate* (15,5 %; Raw Cacao Powder*, Raw Cacao Beans*, Raw Cacao Butter*, Cacao Content 100 %, Cacao Butter Content 35 %), Ground Vanilla*. May contain traces of other nuts and sesame. May contain occasional pieces of nut shells and fruit pits. 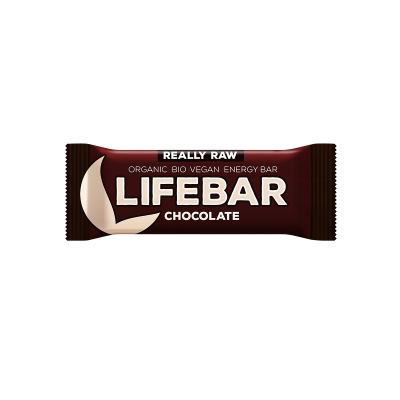 Lifebars are pure healthy raw energy bars for whenever you want to feel alive and strong. They are made only with the highest quality unsweetened nuts, fruits and seeds in organic quality providing a balanced source of energy and nutrients for your body for any occasion. For maximum performance we have boosted our Lifebars with carefully selected superfoods to create an extra energy bar, a Lifebar Plus. 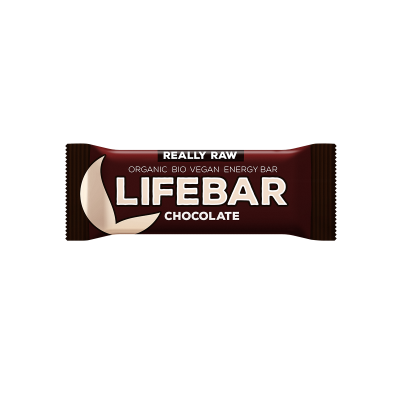 Lifebars and Lifebars Plus are 100 % vegan and gluten-free snack bars. They contain no added refined sugar, no dairy, no preservatives or any other additives and they are suitable for raw food, paleo and gluten-free diets. So handy for whenever you are hungry, have sweet cravings or just need that extra bit of energy to perform at your best. Loved by kids and adults alike.